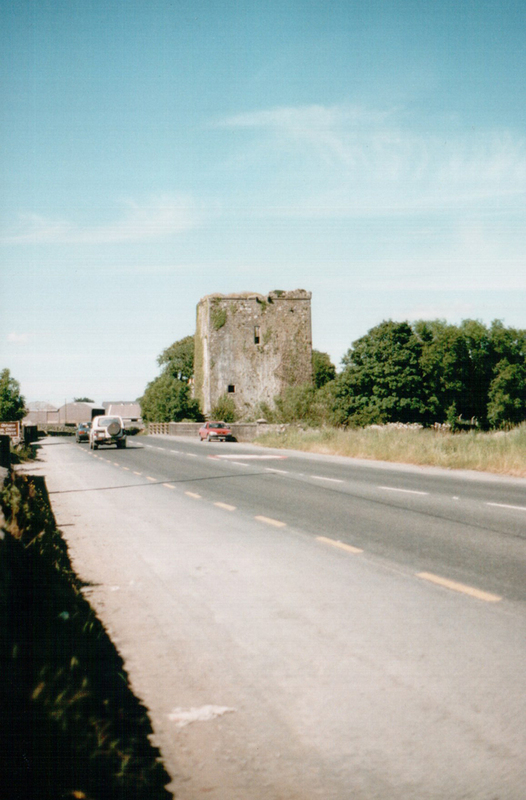 This photo from 2002 shows the Castle as it was for most of the 20th century. Restoration work began shortly after the turn of the 21st century. 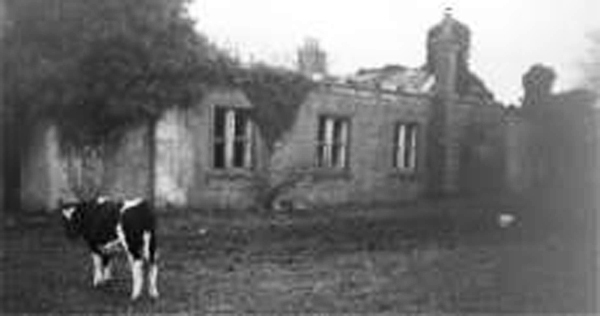 The Castle Lodge spent most of the 20th century housing livestock, as pictured above. It has since been rebuilt as part of the Castle restoration. 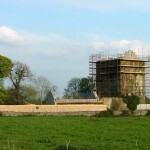 Restoration work began in 2003 after the Castle was purchased by Dr Eamonn O’Donoghue. The work has recently been completed and the Castle has been restored to its former glory. 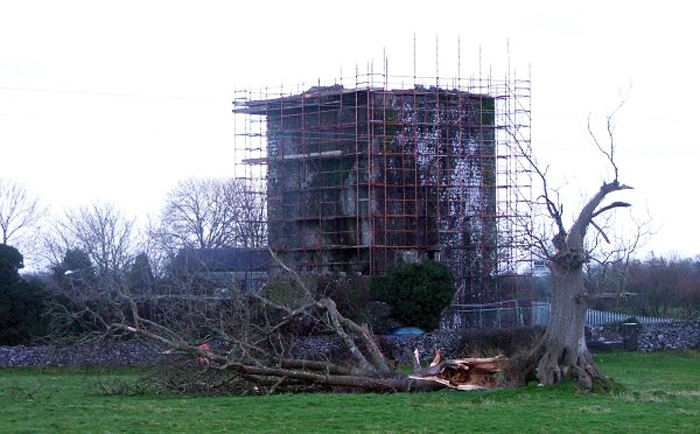 A great storm in 2003 also knocked a tree in the field opposite the Castle (reputed to have been Claregalway’s oldest tree). The tree was struck by lightning and split in half, but has since started growing again. 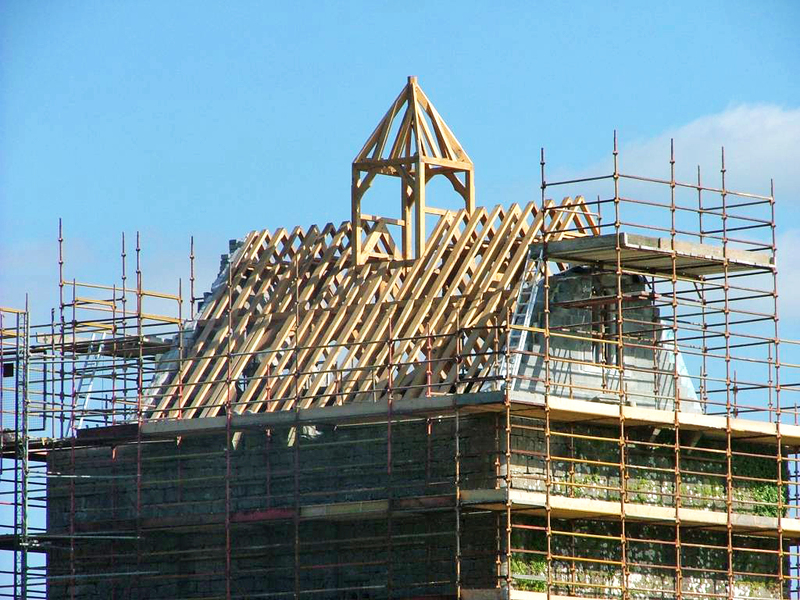 This photo from 2005 shows the reconstruction of the roof of the Castle, which has been faithfully restored to its former glory, including the wall-walk and parapets. Claregalway Castle as it looks today, viewed from the Friary. 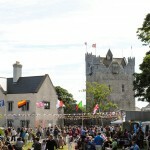 This photo was taken during the 2012 Galway Garden Festival in Claregalway Castle. 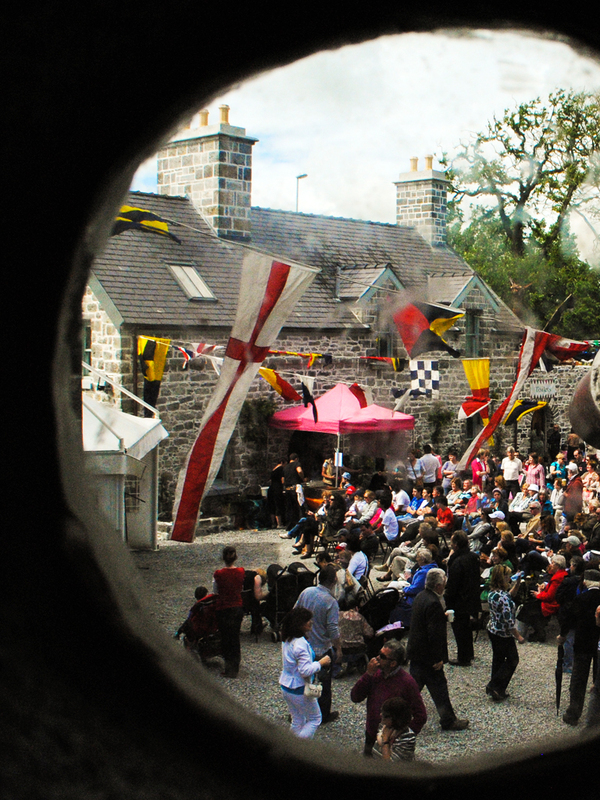 Another snap from the Galway Garden Festival in 2012—a view of the crowds from inside the Castle. 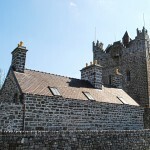 This photo shows the magnificent stonework on the restored Castle and its lodge, as viewed from the N17 entering the village from the Tuam side. While there is no precise information on when Claregalway Castle was actually built, the indications are that it is probably late fifteenth century and may have been built on the site of an older wooden structure. 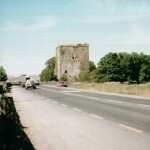 The Castle is situated on the lowest crossing point of the River Clare before she ﬂows through bogland into the Corrib. While commonly referred to as a castle, technically it is more accurately described as a tower house. They were fortified residences that also served in a military capacity. 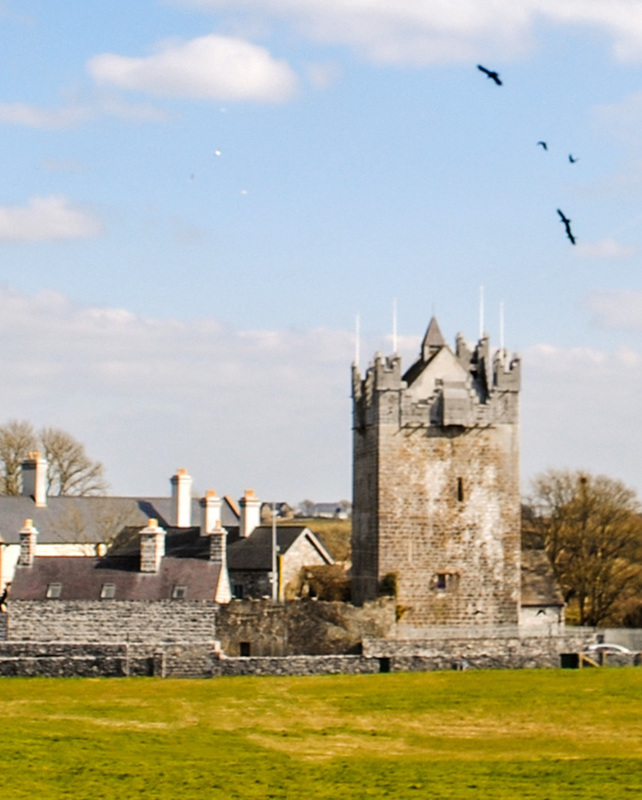 Claregalway Castle is now approaching completion of a ten year restoration and is open to the public daily throughout June to the end of September from 11:30am–4pm. With the help of a Castle guide you can walk the corridors of time and follow the history of the Castle from Norman times to its current restoration, experiencing the masterful woodwork of the great hall and the stonework that has stood against time, wars, ﬂoods and strife for almost a thousand years. References to Claregalway and its Castle keep cropping up because it was an important strategic point in the defence of the City of Galway itself. Some of these references are fragmented and it’s difﬁcult to get a clear picture, but nevertheless we get some idea of what life was like in earlier times. The Normans built a number of castles along the Clare River. The De Burgos were the first of the Normans that came into Connacht. In 1225, King Henry III of England granted the province of Connacht to Richard de Burgo. They secured their territories by building stone castles. They later became known as Burkes and they split into two opposing families, the McWilliam Íochtar (the Mayo Burkes) and the McWilliam Uachtar (the Galway Burkes), who eventually became known as the Clanrickards. Claregalway Castle is a very well conserved rectangular five story tower. Its dimensions are 12 metres in length and 9.75 metres in width. The Castle entrance is by a pointed arched doorway of cut stone near the northern end of the southwest wall. The presence of opposing vertical grooves in both of its jambs indicate that it was protected by a portcullis. The portcullis is a heavy latticed iron grating in the gateway, which could slide up and down in grooves in the doorjambs and was used for protecting the ordinary wooden door of the Castle. There is a small apartment above the door into which the portcullis rose and where the lifting machinery was located. This doorway opens into a small lobby with a guardroom to the left and a spiral stone staircase to the right. This staircase ascends for the ﬁrst 35 feet and then a straight narrow staircase leads from the south side of the Castle to the top. Directly above the lobby is a small rectangular opening known as the ‘murdering hole’. This was used to pour hot liquids down on unsuspecting attackers. A stone vault exists between the second and third ﬂoors. Mural passages occur in the north-east wall on the first floor and in the south-east wall on the third ﬂoor. There are mural chambers in the south-west wall on the first floor and in the south-east, south-west and north-west walls on the third floor. In an upper room with Gothic windows there is a carving of a face, said to be the trademark of An Gobán Saor. There are washrooms inside the south-east wall on the second and third floors. There are ﬁreplaces in the south-west wall on the first floor and in the north-east wall on the second floor. The wall-walk and parapet along the south-east and south-west walls have been restored as part of the Castle restoration. Protecting corbels centrally placed on top of the walls formerly supported machicolations at parapet level. Corbels are projecting stones, firmly embedded in the walls, which were usually intended to carry a wooden beam or in this case machicolations. A machicolation was a projecting parapet on the top of a Castle wall with openings in the bottom through which missiles could be dropped or discharged on attackers. They protected defenders who were trying to attack the assailants at the base of the Castle wall. There was at least one positioned directly over the Castle entrance. 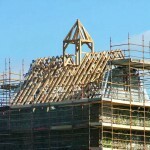 The roof was probably originally made of oak and thatched, as lead roofs were not common in Irish Castles. There were no windows in the lower 20 feet, only loopholes. The Castle was designed to be defended by archery and was never modiﬁed to meet the requirements of ﬁrearms. The loopholes are narrow slits that were wider on the inside to give the defender an advantage when shooting arrows or guns. A variety of window types occur in Claregalway Castle. Many display Gothic-like features including pointed arches, ogee heads, an intricate curved design and one that is mullioned and transomed (vertical and horizontal stone bars). Knockdoe is about two miles from Claregalway and it was where the forces of Garret Mór Fitzgerald, Earl of Kildare, who was the Lord Deputy of Ireland, fought the Clanrickard, head of the Burkes in 1504. Garret Mór Fitzgerald led his army from Leinster to thwart the ambitions of Clanrickard. The Burkes had a number of Irish chiefs fighting with them and they also had engaged Scottish mercenaries known as Gallowglasses. It was the first time that guns were used in Ireland to do battle. According to reports they were not sure how to ﬁre them and they used them as clubs instead. Clanrickard was defeated and thousands were killed. Claregalway is mentioned twice in connection with this battle. 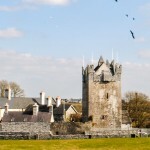 The night before the battle, the Burkes “played cards in the Castle ’til late hours of the following morning and they were drinking.” After his victory, Garret Mór marched towards Galway, looting Claregalway Castle en route, and taking as prisoners the two sons and a daughter of Ulick Burke. In 1538, Lord Gray on behalf of King Henry VIII attacked Claregalway Castle with 250 regular troops and artillery. This artillery included cannons such as a half culverin, a saker and double falcons. Lord Gray took the Castle and handed it over to Ulick Burke, it is said, for cash. 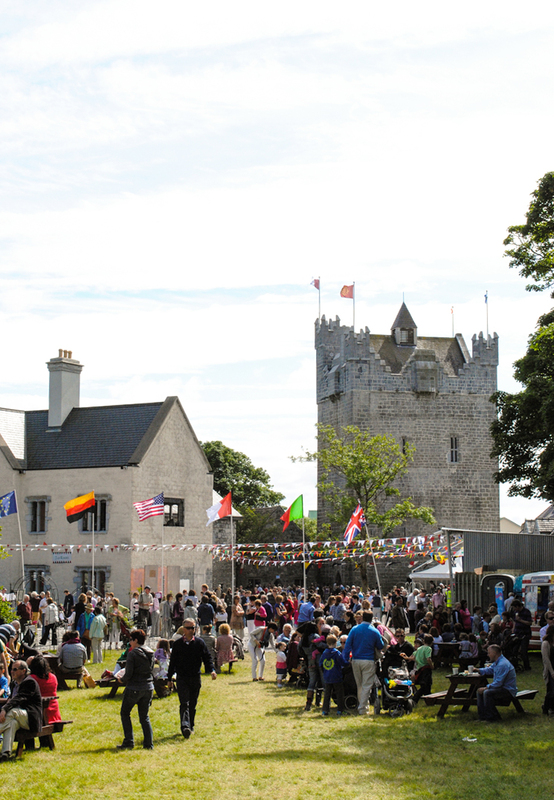 In 1571, Sir Edward Fitton, the President of Connacht, was camped outside Claregalway and he reported that “we are refused at the Earl’s Castle by the Earl’s son where the rebel is the constable of the Castle and upon hearing of our coming to pass by it to Galway, he burned the town, uncovered the Castle and offered plain resistance.” This action may appear strange, but an important tactic in defending a Castle was to burn the town so the army coming in would not have any shelter or food and to unroof the Castle, which was made of thatch, so as to prevent archers from ﬁring burning arrows into it. 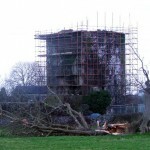 They could defend it perfectly when it was unroofed. However it was reported that Fitton captured the Castle and put the garrison of sixteen men to death. In 1572, the Earl of Clanrickard had two sons, John and Ulick, who were wild and uncontrollable and caused a lot of turmoil and destruction around Athenry. They were described as “the most executable evil-doers, doing destruction across Loughrea, Athenry and so on.” The mayor of Galway wrote to the Lord Deputy complaining about the two sons. In 1576, under the English Surrender & Regrant policy, the Earl of Clanrickard surrendered the Castle to Queen Elizabeth and she re-granted it back to him. Between 1603 and 1625, King James I made a number of grants to local lords to hold fairs and markets in order to boost the local economies. Cattle trade became very important. 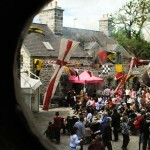 The Earl of Clanrickard was granted a licence for a weekly Wednesday market at Claregalway. In October 1641, rebellion against the English rule broke out in Ulster and soon spread to the rest of the country. For the next eight years, England was the scene of a fiercely fought civil war between King Charles I and the extreme Protestants or Puritans led by Oliver Cromwell. The fighting soon spread to Ireland where armies supporting both sides fought each other. The Catholic rebels, who included Old Irish and Anglo-Irish, formed the Federation of Kilkenny. The Earl of Clanrickard, who was the King’s Governor of Connacht, eventually became involved but was a reluctant rebel. In 1642 Claregalway Castle was strongly garrisoned by Clanrickard, who described it as his “chief place of strength and importance… both to curb the town of Galway and command the country thereabouts.” He used it as a base for operations to overcome Galway and it was there he received the proposals for the surrender of Galway, as signed by the Mayor Walter Lynch and delivered by Dominic Browne and others. In 1643 the Castle was surprised by Captain Richard Burke of Anbally, through the treachery of a tenant, the carelessness of the warders and the collusion of a Franciscan friar. Its giving up was one of the conditions of the treaty for the surrender of Galway. The Papal Nuncio was in Galway and he wrote to Clanrickard about the capture of Thomas McKiernan of the Franciscans in the Castle and he asked that he be released, and later, after the execution of King Charles I, William Cromwell landed in Ireland in 1649 with a big army with the purpose of putting down the rebellion. He quickly captured a number of towns and departed in May 1650, after . Sir Charles Coote, a Cromwellian, seized Claregalway Castle in 1651. Galway was the last stronghold to surrender to the Cromwellians. Thus ended about ten years of warfare, which was then followed by the Cromwellian Plantation. Claregalway Castle, like so many others of its kind, was little used after 1700. The dwelling house, known locally as the ‘Castle Lodge’, was built by Captain Palmer and has had various owners over the past century. Until recently it was used to house livestock, before being purchased by Dr Eamonn O’Donoghue and restored along with the Castle. 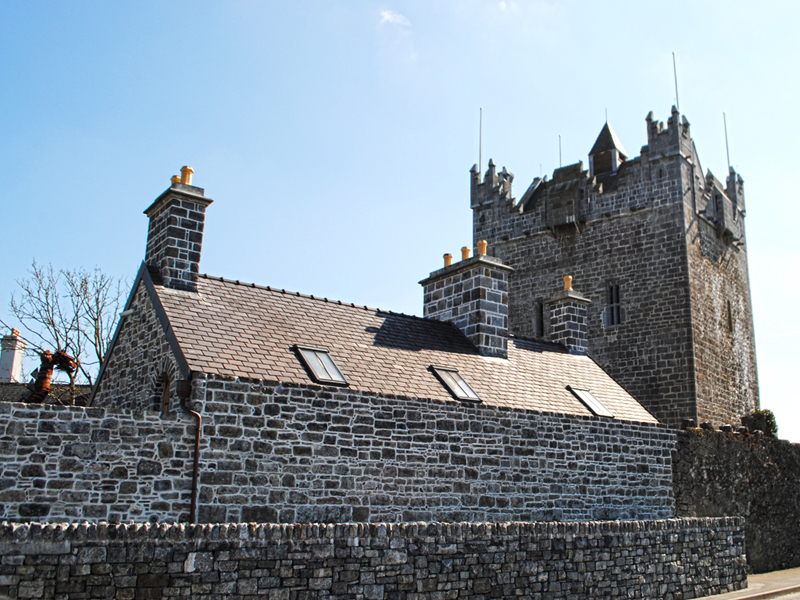 Dr O’Donoghue has funded and overseen the restoration of the Castle for the past decade, bringing in some of Europe’s top stonemasons and conservationists to ensure that the Castle is returned to its original state. In the process, he had to overcome many obstacles in his mission to ensure that the Castle was restored to the style in which it was constructed. 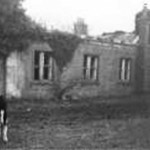 Were it not for his drive, the Castle would be left to fall like the 27 other Castles which are in various states of ruination in the hinterland of Claregalway and Turloughmore and Knockdoe. Eamonn O’Donoghue never forgot the childhood picnic shared with his brothers and sisters and parents beside the bridge at Claregalway Castle. His father, Tom, a Toomevara man, a great hurler, and a civil engineer with Cork County Council, had a passion for Ireland’s romantic ruins. A photograph was taken of all seven O’Donoghues lined up grinning at the bridge. The family still have it at their Cork home. But Tom’s passion passed on to several of his children. Eamonn studied Medicine in Cork, and Archaeology under Michael J O’Kelly, the man who brilliantly interpreted the ancient tombs at Newgrange. Shortly after his appointment as ophthalmic surgeon to the Western Health Board (HSE), Eamonn set out to find the Castle. He had no idea where it was, except that it was near the city. He drove out every approach road to Galway until one evening there it was—a vast crumbling tower, ivy-clad, with ruined buildings within its courtyard, exactly as he remembered as a child. On that very first evening of re-discovery, Eamonn met Canon Callanan, the local Parish Priest at the time, and an entertaining classicist, who told him some of the history of the area. Taken in conjunction with the spectacular ruins of the nearby Franciscan Friary, the medieval bridges, the village itself, the “ghosts of other buildings and landmarks” (really only visible from the air), it soon became clear to Eamonn that this was a monument of major significance. 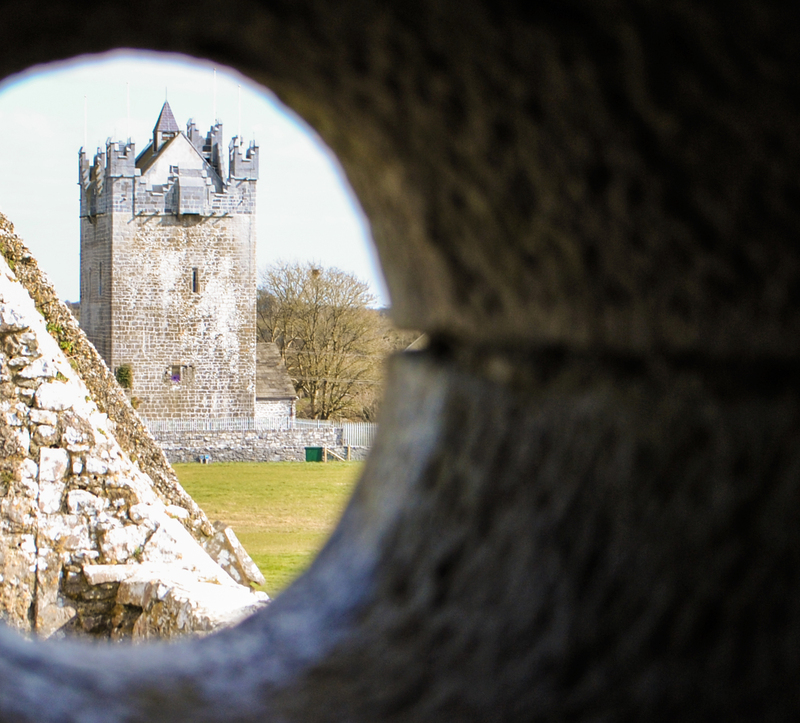 Its battlements not only protected a main road into Galway, but looked down on the ancient Barony of Clare, which originally incorporated the vast and fertile plains of east Galway, known in pre-Norman times as Magh Seaola, and witnessed its evolving story. The Castle was owned by John Buckley Jr (formerly of Spiddal House), then living in Indonesia, who agreed to sell. The next challenge was to get the various permissions required for a major transformation, and the team to make it happen. Two friends, David Newman Johnson, former Keeper of National Monuments, and Archaeologist Leo Swan, gave moral and expert support. Galway County Council was, from the start, supportive in principle, but there were difficulties with the many conservation agencies along the way. “I wanted to do the job as correctly as possible, but there is a need to reevaluate the evolution of conservation principles in Ireland today,” said Dr O’Donoghue. Delays were costly and drawn out. 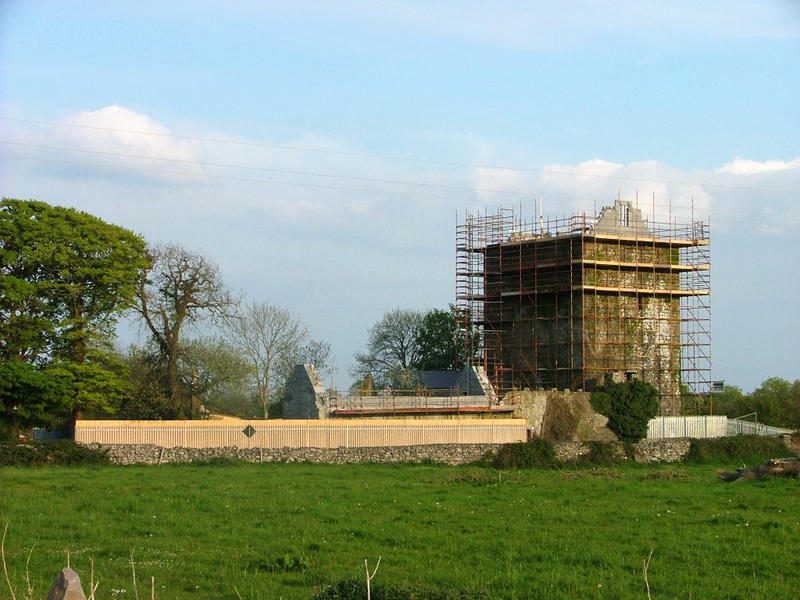 And now, more than a decade later, the restoration programme is almost complete on this important 15th century tower house—one of the largest and most significant tower houses in the west of Ireland. Visitors can get a close view of the sympathetic restoration programme carried out by Master Builder Michael Herwood from Cloonacauneen and French Stonemason Jean Baptise Maduit. For more information on Claregalway Castle, visit www.claregalwaycastle.com.